Women face huge challenges in Nepal, one of the poorest countries in the world. Caste and gender discrimination lead to low education levels for women. Nepal has a strong patriarchal society and as such, in a country where families have little, the focus is on male education. Poverty means that girls may be sold, trafficked or sent to the city to find work, where they are at a disadvantage to men, due to low literacy levels and lack of skills. With families reliant on them, many women resort to the entertainment sector, where they are easily exploited by employers because they have no understanding of their rights and are afraid of losing their jobs. Once in the industry they are trapped as they lack the skills, knowledge, funds and resources to escape. This is where WONDERWorks aims to help. SMALL BEGINNINGS (Small business start ups). We provide grants to start up small businesses. The grants are non-refundable but the recipients are asked to contribute a donation, once profits allow. This is then channelled back into the programme, to fund others on the waiting list. Prior to setting up we run business workshops over five weeks and once a business has been established, we carry out monthly follow ups for eighteen months. We offer Basic and Advanced tailor training classes, where students attend classes for two hours every week day, over a six month period. Students are then eligible to apply for a tailoring business upon successful completion of our five week business workshop. We run occasional Women’s Health Camps, working with partner NGO’s, in addition to professional First Aid Training courses for NGO staff and Shelter Mothers. This is an emergency response program for women and children in dire situations who have nowhere else to turn. Help can be in the form of funding, relocating, temporary accomodation, medication costs and so on. Most of the women and children come to us through referral from partner NGO’s who are unable to offer the help they need. Our Support Centre in Kathmandu comprises a Safe House, Tailoring Centre, Showering Facilities, Office and Activities Room. We aim to address the safety and mental well-being of the women and children who come through our doors. Activities include Mother and Toddler Groups, School Holiday Programs, Self Defence Workshops, Dance Therapy, English Conversation, First Aid and Skills-Training Workshops. Our centre also provides access to sewing machines and materials, so that needful women can drop in and earn a fair wage for sewing the washable sanitary pads for Project Dignity. Firstly by providing free washable sanitary kits so that girls may particpate in school with dignity and confidence during menstruation. 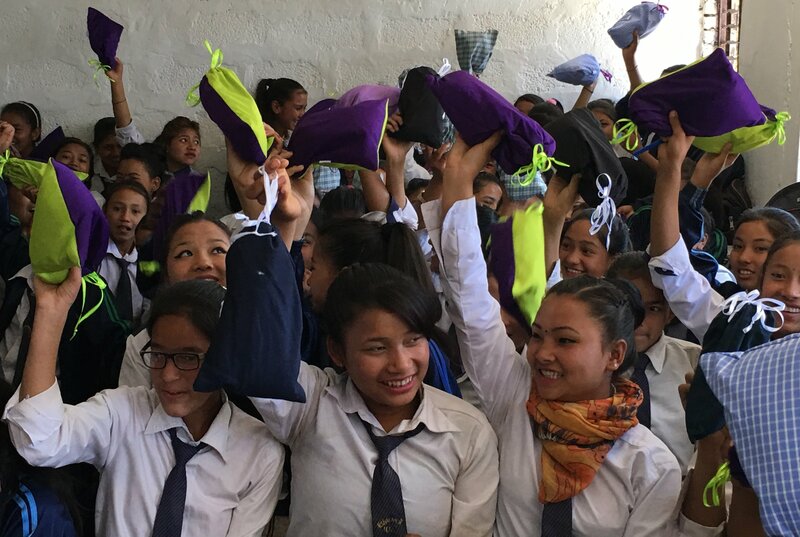 Secondly, by providing a dignified form of income for exploited and trafficked women in Kathmandu, paying a fair wage to make the sanitary kits.